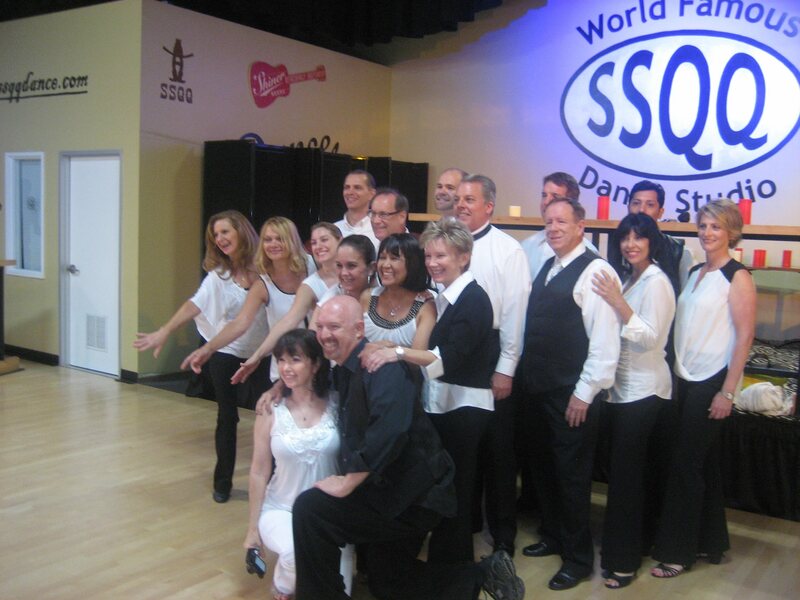 This August marks the 4th anniversary of the new SSQQ Dance Studio and the 4th anniversary of our heading the West Coast Swing program there! We really makes us proud to see how far we’ve come as a studio and to have been able to part of something like this! I still remember our first month of classes where we might have had 40 people total in all 5 classes. And now we regularly have 30-40 people in EACH class! We continue to grow and we cannot thank our instructors enough for how much work they have put in and to the SSQQ Studio owners, Daryl and Jo Anne Armstrong for believing in us. So this last Saturday was the SSQQ Summer Showcase! This was the 2nd year to do this and it’s a great opportunity for our instructors and students to show off a bit so that others can see what they’ve been learning – and maybe even find a new dance that they want to try! There was a little bit of everything – from country to tango, east coast swing and west coast swing (of course) and salsa, bachata and even some burlesque! I was especially proud to get to see some of our West Coast Swing students go out there and perform. For many of the people on the exhibition team, this was their first time performing and I thought they did a great job! Kudos to Michael Stephens and Karen Wisniewski for some great coaching as well! Trent and I also got to do some exhibitions. Matthew and I were able to do a nice run of our pro-am routine ahead of Dallas Dance. Trent and I did 2 exhibitions – one slow whip for many people who had never seen that before – as well as a west coast swing exhibition. Both were super fun! The stand out of the evening was the very last performance. It was an East Coast Swing exhibition by a couple of our long time students – a father-daughter duo! It just so happens that it was Gareld’s 85th birthday as well! They were fun, entertaining and so full of energy. I hope to be dancing like Gareld when we’re 85! Trent and I had taken a couple of months off from our Advanced techniques class at SSQQ Dance because of travel and to take a little breather. We missed the first week of the December classes because we were traveling back from Ohio, but we were back last night! Even though we felt a little rusty (for some reason, I just could NOT count correctly last night), we had a great time and we hope the students did too. It was wonderful to be welcomed back into class last night by our continuing students as well as a couple of new ones. Shoutout to Trent for working so hard to make improvements and we want to thank all our instructors for working just as hard in supporting us and believing in our WCS program. You guys are what makes this work!